The SRNY celebrated America's 231st Flag Day with color, music, and military flair on Friday, June 13, starting with a parade at 12 noon. 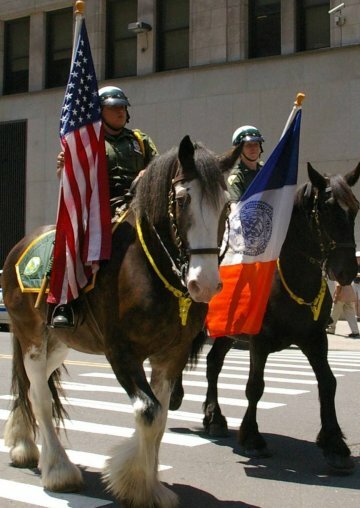 Wending its way from City Hall Park to Fraunces Tavern®, the parade included hundreds of enthusiastic students; military, patriotic, civic color and honor guards; scores of members of patriotic and lineage societies. 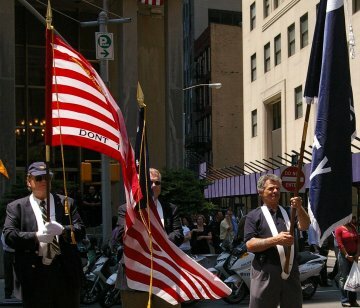 The SRNY Color Guard brought up the rear in fine style with a selection of Revolutionary War-era flags. Outside Frances Tavern®, the stage was set for a special program that was enjoyed by SRNY members, guests, and the noontime Wall Street crowd. The NYC Dept. of Sanitation Pipes and Drums of the Emerald Society led off the program with several stirring tunes, followed by a hearty welcome from SRNY President John Mauk Hilliard. The Rev. Christopher M. Cullen, SRNY Chaplain, delivered a heartfelt invocation and blessed the colors. Mrs. Deborah Thomas Shull sang her always-stirring rendition of our National Anthem. Following the pledge of allegiance, students Nathanael Vega and Gina Hopkins read their winning Flag Day Essays, part of an annual competition sponsored by the SRNY. The USO Show Troupe entertained the crowd with a medley of hits from the 1940s to the present, including (of course!) Boogie-Woogie Bugle Boy, Don't Sit under the Apple Tree, Bei Mir Bist Du Schoen, military anthems, and the contemporary classic, Proud To Be an American. At the end of the program, the colors were retired with dignity. Stempel Bennett Claman & Hochberg, P.C. The SRNY is grateful to the many donors and friends without whose contributions this annual event would not be possible, and to the scores of patriotic and lineage societies who participated. The list of thank-yous would not be complete without special mention of Margaret O'Shaughnessy (SRNY administration), Cecelia Mahnken (accounting), William Unger (Color Guard), Lynne Ridgeway, and Emily Westervelt, all of whom made the day a great success! If you would like a copy of the program for Flag Day 2008 (including lists of marchers and sponsors), please email the editor and request a pdf. In May and June, representatives of the SRNY went on the road to present major awards to top students at two military academies. On May 30th, Board Member Philip Coombe III traveled to the U.S. Military Academy (West Point, NY) to present the Knox Trophy to Cadet 1st Captain Jason Crabtree (Kingston, WA) as an acknowledgment of his high achievement. The SRNY established this award on October 8, 1910 in honor of Henry Knox, first U.S. Secretary of War. The original Knox Trophy is kept on permanent display in the Office of the Commandant at West Point. Each winner's name and the year are inscribed on the trophy. Since the early 1960s, each winner has also received a keepsake silver Revere Bowl. A newer, but no less prestigious, honor is the Captain Gustavus Conyngham Award, established by the SRNY in 1999. It commemorates Captain Conyngham, a Revolutionary War naval officer and privateer, and is presented to the midshipman with the best overall performance during training at sea, with particular emphasis on sea project grades and ship evaluations. On June 13th, Board Member Steven Trusnovec traveled to the U.S. Merchant Marine Academy (Kings Point, NY) to present the 2008 Conyngham award to Midshipman John Michael McGurk. Museum Director Amy Northrop Adamo is pleased to welcome graduate intern Rachel Gershman from Columbia University this summer, who will be assisting with an inventory of the entire museum collection. Among the treasures already uncovered in this inventory are the uncatalogued papers of General Henry Burbeck. Burbeck's papers in Fraunces Tavern Museum's collection include orderly books, accounts and letters from the Indian Wars and Michilimackinac right up though the War of 1812, and a number of family letters as well. They were given to FTM, along with Burbeck's swords and several family items, during the first half of the twentieth century by Colonel Chandler Smith, Burbeck's grandson, SRNY member, and a military man in his own right. Born in 1754, Henry Burbeck was the son of Colonel William and Jerusha (Glover) Burbeck. American-born William was an artillery officer in the British Army, stationed at Castle William in Boston. However, at the beginning of the Revolutionary War, the elder Burbeck turned to the patriot cause. In May, 1775, his 21-year-old son Henry enlisted in the army and received his commission as Lieutenant of his father's regiment. Henry Burbeck saw active duty as an artillery officer in most of the major conflicts (and sufferings) of the war, including the Battle of Long Island and the evacuation of New York, the Battles of Brandywine and Germantown, the terrible winter at Valley Forge, and the Battle of Monmouth. Burbeck returned to private life when the army was disbanded in 1783, but three years later he re-enlisted in his country's service as an Artillery Captain. He was one of the officers who urged President Jefferson to create a national military academy at West Point. Burbeck later taught there. More active duty followed: he served in the Indian Wars on the western frontier under General Anthony Wayne and commanded Fort Mackinaw for four years. 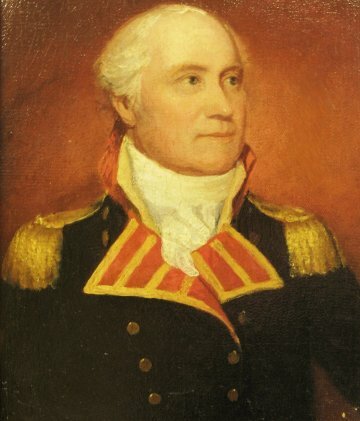 Burbeck also held command at New York, Newport, New London, and Greenbush during the War of 1812; at the end of the war, he retired in 1815 with the rank of Brigadier General. At the time of his death in 1848 at the age of 95, he was President of the Massachusetts Society of the Cincinnati. Museum staff look forward to eventually cataloging and scanning all of the Burbeck papers and making this untapped resource available to researchers. FTM's Portrait of William Livingston by John Wollaston is currently on loan to Morven Museum & Garden in Princeton, NJ, as part of their exhibit Picturing Princeton 1783. This fascinating show commemorates the several months 225 years ago that the United States Congress made Princeton its home. William Livingston was then Governor of New Jersey. The Museum's portrait is the only extant period image of him. Shortly, FTM will lend another painting  John Ward Dunsmore's Washington and Staff at Fort Lee  to Morven Museum's neighbor, Drumthwacket. There, in what is now the Governor's mansion, the painting will hang for one year in the front hall, a place of honor. This painting was conserved two years ago thanks to a generous grant from The Bay & Paul Foundations. Jennifer Patton reports that, after a very busy academic year, the Museum will be active this summer as it hosts tours for teacher groups and university classes in July and August. A noteworthy visit will be that of the almost 300 students from the City University of New York's Summer Intensive English Language Program (SIELP); students will visit throughout the summer and participate in our collaborative program with Federal Hall. Sponsored by the Board of Education on four CUNY campuses, SIELP is an impressive program that helps young teens who have recently emigrated from many countries to improve their English writing, reading, and speaking skills. They take only two field trips during the summer, and Fraunces Tavern is one of those destinations. As Jennifer stated, I know that the students are eager to learn about New York City history and the American Revolution. She continues, After working with SIELP for the past few years, I've found that the students' cultural diversity has given me and my docents the opportunity to learn about our own native countries. Many times we've found that their students' heritage and traditions are quite similar to our own. Stay tuned for news of fall Education and Museum events in the August Patriot . 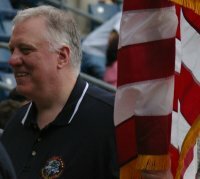 On Wednesday, June 18, members of the SRNY Color Guard (Jonathan Wolk Ridgeway, Chairman), trooped the colors at the Staten Island Yankees' home opener against the Brooklyn Cyclones. The SI Yankees (Class A-Short Season) play their home games at the Richmond County Bank Ballpark, to the delight of baseball fans who love to see baseball up close and feel the occasional foul ball zinging overhead. This clean and inviting stadium holds about 6,800 spectators, has great sightlines, and is a stone's throw away from the Staten Island Ferry Terminal at St. George. All looked promising as Color Guard members and friends gathered under the grandstand to chat with the umpires (two hard-working ones), meet the energetic Pinstripe Patrol and host Joey (the ballpark's on-field entertainers), costumed mascots Red, Huck, and Scooter, and media from various newspapers and NY1. Suddenly, storm clouds gathered. The ground crew sprang into action, drawing a tarp over the infield. Bad sign, a reporter said. If they didn't expect a storm, they wouldn't drag out the big tarp. Inside we went. Red, Huck, and Scooter huddled up for a nap as the ballpark staff gave periodic reports on the rain. I don't know ... said the home plate umpire, shaking his head. I see lightning, observed the other. The drizzle turned into a downpour as the sky over the park turned a darker grey. Who's going for hot dogs? asked Capt. Ridgeway. As the teams and Color Guard stood at attention, local businessman Brandon Stradford sang the national anthem with style and gusto. And then, batter up! to cheers for the home team, the smell of popcorn, cotton candy, and roasted peanuts. The Yankees were at their scrappy best - but, sorry to say, they lost, 9-4. 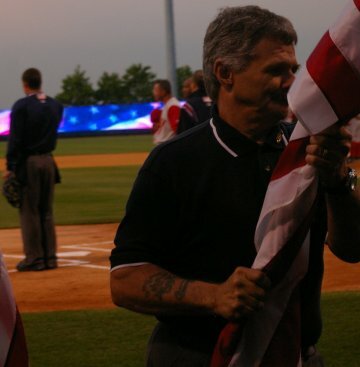 No matter; it was an excellent evening of family fun, patriotism, and spirited local baseball. Visit the Staten Island Yankees website for more information on the ball club, including schedules and tickets. The SRNY Color Guard is scheduled to appear again at Richmond County Bank Ballpark on June 29th as part of Military Appreciation Day. Three cheers to Nicholas Trusnovec, who was given full membership in the Color Guard at the Board of Managers meeting on Monday, June 23. Nicholas is the son of CG Sgt. Steven Trusnovec and has already done three years of ordered duty. During this time Nicholas also marched at the 225th Anniversary of the Battle of Yorktown, VA, CG church services, and the Memorial Day Parade in Douglaston/Little Neck. On June 23, the CG also extended a warm welcome to new member Alan W. Borst, Jr., who is Secretary of the SRNY. 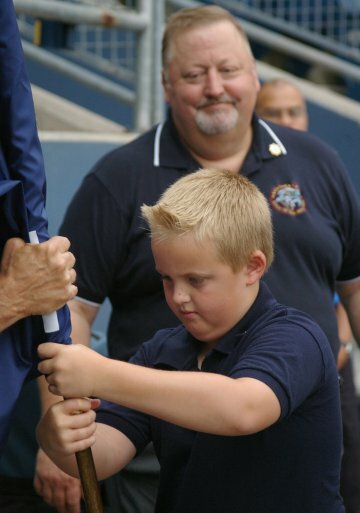 Alan has served the SRNY faithfully for many years and is now a wonderful addition to the CG. In partnership with Home Box Office (HBO), SRNY/FTM is pleased to announce the John Adams Raffle! Only members of the SRNY and FTM, and individual and corporate donors, are eligible to enter. The prize: a DVD of the critically-acclaimed HBO mini-series, John Adams. Twelve copies of the DVD will be raffled on July 15. If you would like to enter the contest, please contact Allison White, Director of Development, at SpecialAssistant@sonsoftherevolution.org or 212-425-1776 ext 18. Deadline: July 10, 2008. Be sure to provide your name or that of your organization and supply your preferred contact information. Winners will be notified and DVDs will be mailed on July 15, 2008. Good luck! From time to time, The Patriot will update you on events sponsored by other heritage societies. We'll also post invitations whenever possible, so be sure to stay in touch. On June 19, the Colonial Dames of America hosted a Midsummer Eve Garden Party at the Mount Vernon Hotel Museum & Garden, in honor of Historic Jamestowne. The SRNY was one of eight co-sponsors of this event, made perfect by its lush and lovely outdoor setting, glorious weather, delicious refreshments, and, of course, congenial company. Many societies were well represented by members and leadership. Our thanks to Audrey Svensson, President General, Colonial Dames of America, and her colleagues for making this a memorable event! Audrey Svensson, President General Colonial Dames of America; John P. Kleiss, President, The 1st New York Continental Chapter, SAR; Joan Aalde, Regent, Mary Washington Colonial Chapter NSDAR; Nancy Shackelford Jones, Regent, New York City Chapter, NSDAR; Alice Stuart, Governor, Order of Ancient Planters, New York Company. Not available for photo: John Mauk Hilliard, Governor of The Jamestown Society, New York Company and President of the Sons of the Revolution in the State of New York; and Charles Neuhauser, Governor, The Society of Colonial Wars in the State of New York. 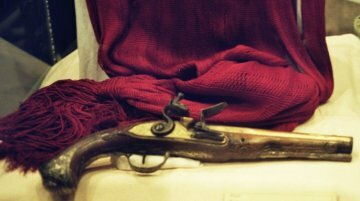 The crimson sash (from the collections of Fraunces Tavern Museum) now on display at the New-York Historical Society (through Aug. 10) was used to bind the wounds sustained by Lafayette at the Battle of Brandywine. If you haven't yet seen this fascinating exhibition, do make time for a visit.